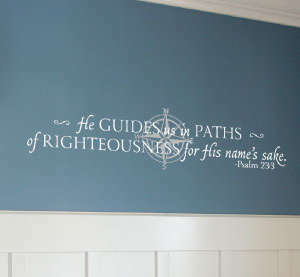 Decorating wall spaces with scripture is a tradition that has been handed down over the years from generation to generation. WiseDecor continues with this practice, but adds a decorative twist to it- with great results! 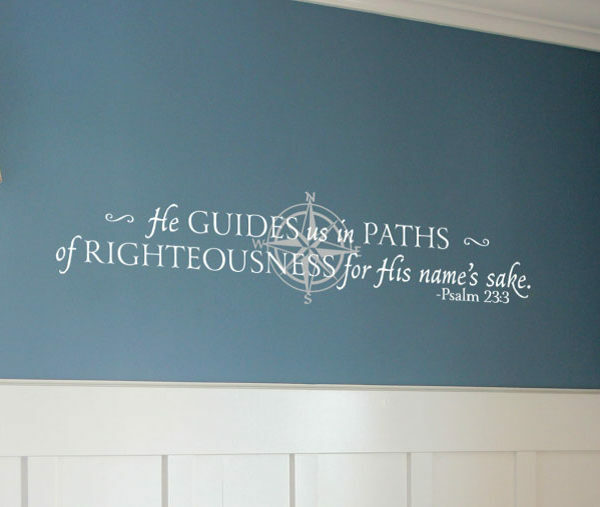 “He guides me in paths of righteousness for His name’s sake.-Psalm 23:3” wall words are an example of what we have in store. They are perfect for this bedroom! They pop out against the blue underlying wall, above the bed. Waking up to this amazing promise is a great way to start your day, every day! The theme in this bedroom is sea based. 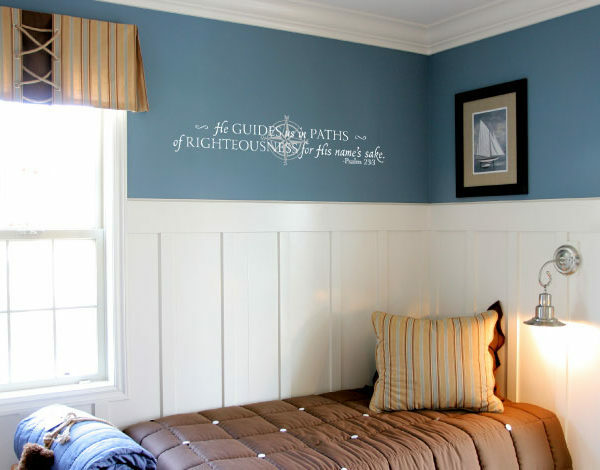 The blue wall reflective of the sky and the sea is a great background for the wall letters. The lettering style is a mixture of bold and festive which creates a reassuring mood of God’s ability to keep His word concerning us! They also tie in with the duvet, and the sleeping bag. 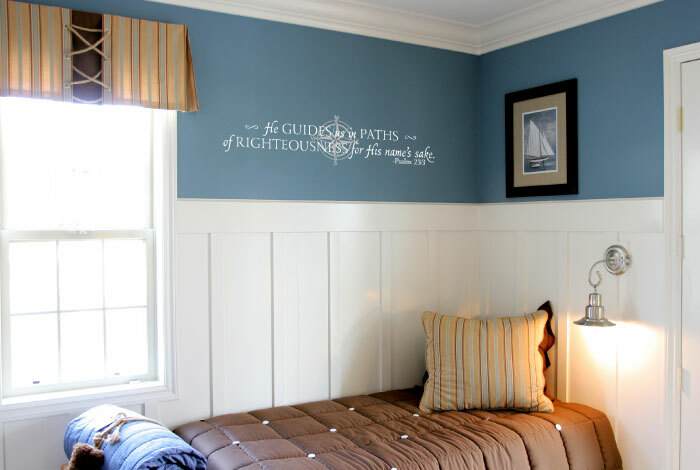 While the framed photo captures the owners love for all things sailing, our wall quotes, navigation compass and lettering art show their appreciation of God’s guidance as they sail out! The lettering is easy to apply. It is pre-spaced and takes out the guesswork and hassle of doing this on your own. When placing your order use our previewer to make sure that you have chosen the right style, size and color for your wall space. 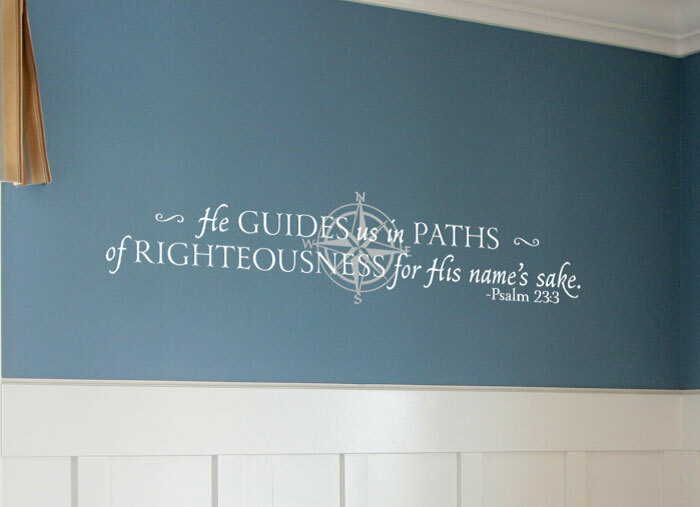 Get in touch for stylish wall decals!